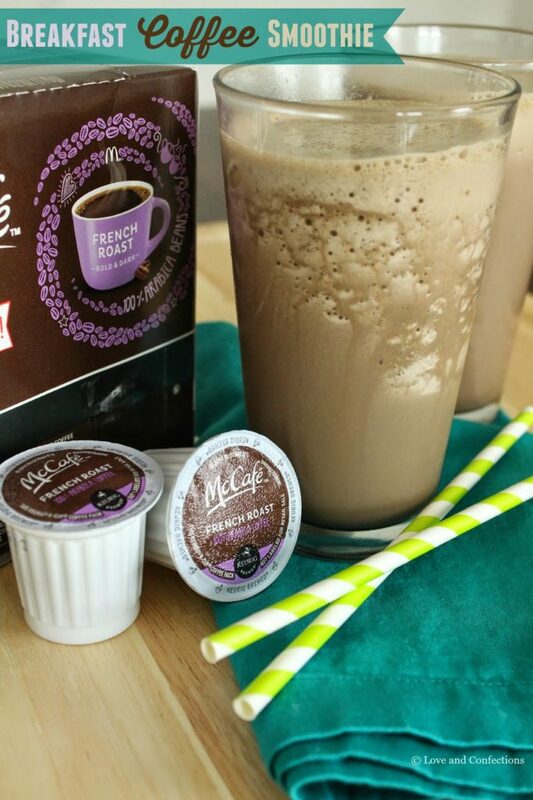 A Breakfast Coffee Smoothie, made with frozen bananas, yogurt, McCafé Coffee Pods and coffee ice cubes, is the perfect accompaniment to start your day! I love smoothies because there are so many different options to choose from – fruity, green, chocolate, coffee – the possibilities are endless. What’s even better is having my smoothie ingredients prepped the night before so all I have to do is wake up and blend them together. Some mornings don’t always go as planned. I would love to say that I always have a nice, hot cup of coffee in the morning while eating breakfast. When you have a 15-month old rambunctious little girl, a hot cup of coffee doesn’t always happen. I brew myself a cup of McCafé coffee for breakfast and usually come back an hour later realizing I only was able to drink half before I had to leave it and the coffee got cold. I sometimes enjoy a hot cup of coffee as “me time” if she happens to take a morning nap, but some days I want the coffee bright and early. This breakfast coffee smoothie is great because I am able to prepare everything the night before, so I don’t have to worry if Toddler L&C decides she needs to be read her favorite story 5 times in a row right now, or she wants take every toy out of the toy-box before 8am. You can find McCafé in the coffee aisle in your local Walmart. 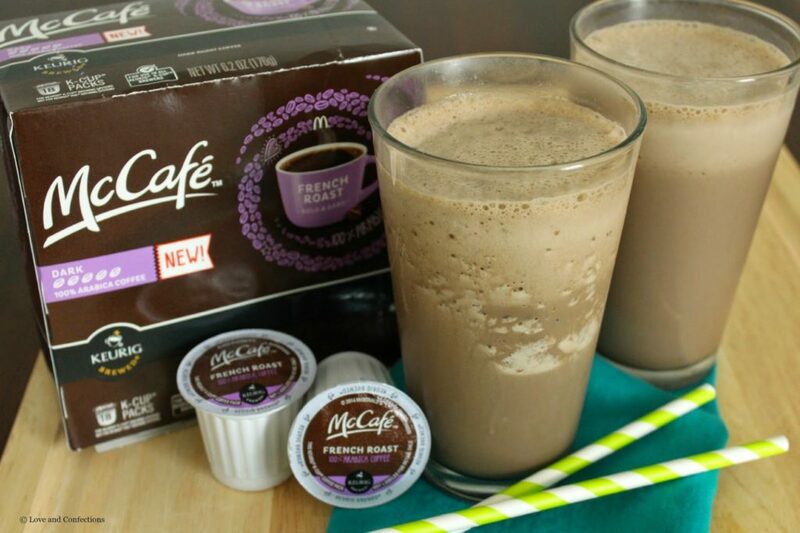 McCafé is available in 8 flavors, so you have lots of options to choose from. Brewing options are either premium bags or coffee pods. I don’t know what I would do without my coffee pod brewer. 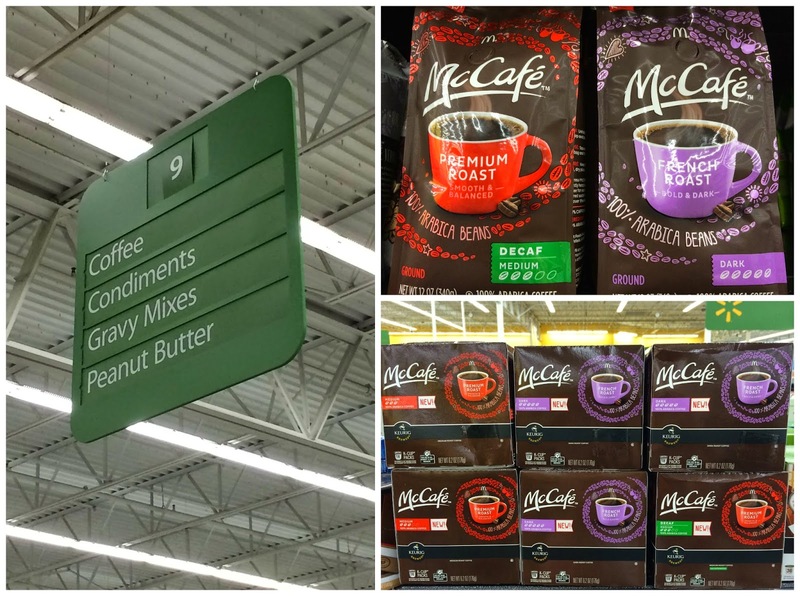 McCafé Coffee and Pods are made with 100% Arabica Beans, so you know it is good quality coffee – which is what this Momma needs in the AM. The beans are harvested from rich soils and mountainous regions of the foremost coffee-growing areas of the world. I love trying out new coffee pod flavors and mixing it up. 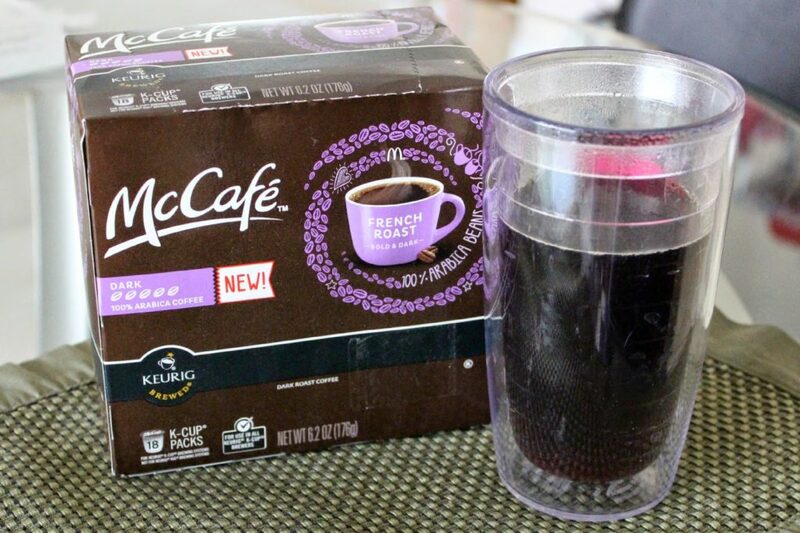 McCafé tastes great and I can’t wait to try all 8 flavors in my morning routine. 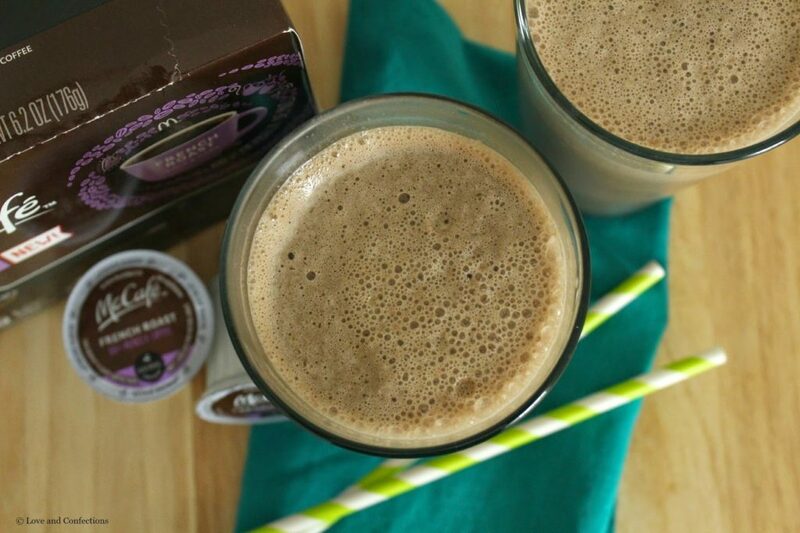 The French Roast is a nice, smooth, bold and dark flavor – the perfect compliment to my morning smoothie. 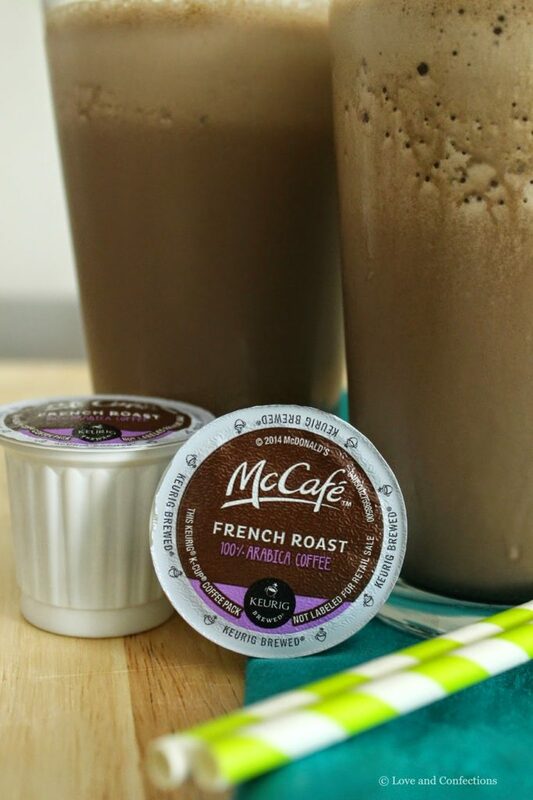 To help boost the coffee flavor in my smoothie, I brewed some McCafé French Roast the night before, let it cool to room temperature, and poured it into an ice cube tray to freeze overnight. These coffee cubes are a great way to get some extra coffee flavor into your smoothies. 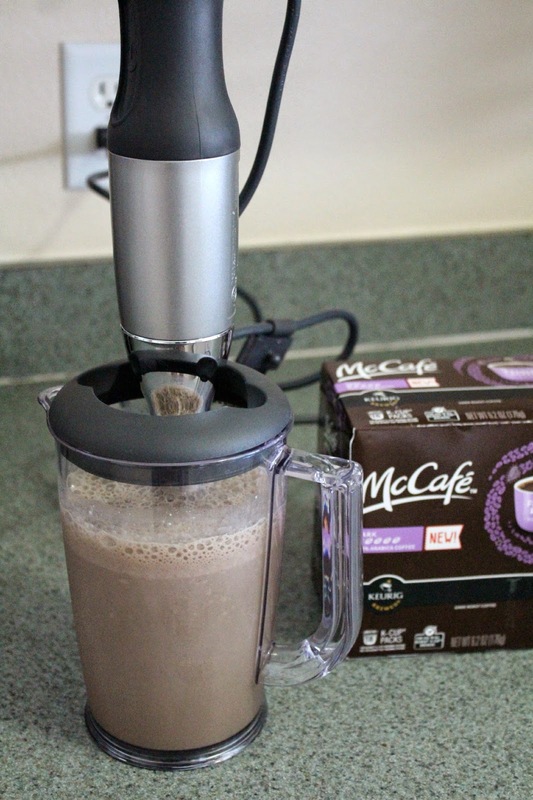 If you want to brew yourself a McCafé Iced Coffee, don’t water it down by using regular ice cubes. 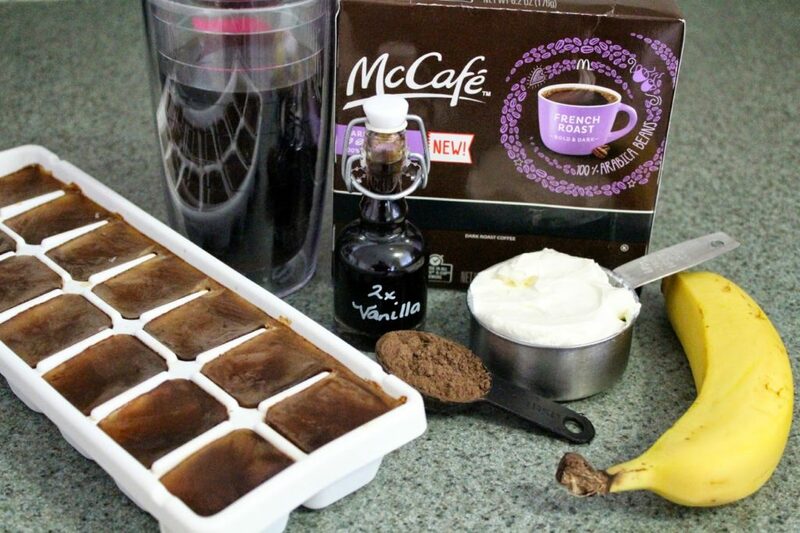 Instead, use the coffee cubes to keep that great coffee flavor and chill your drink to icy perfection. 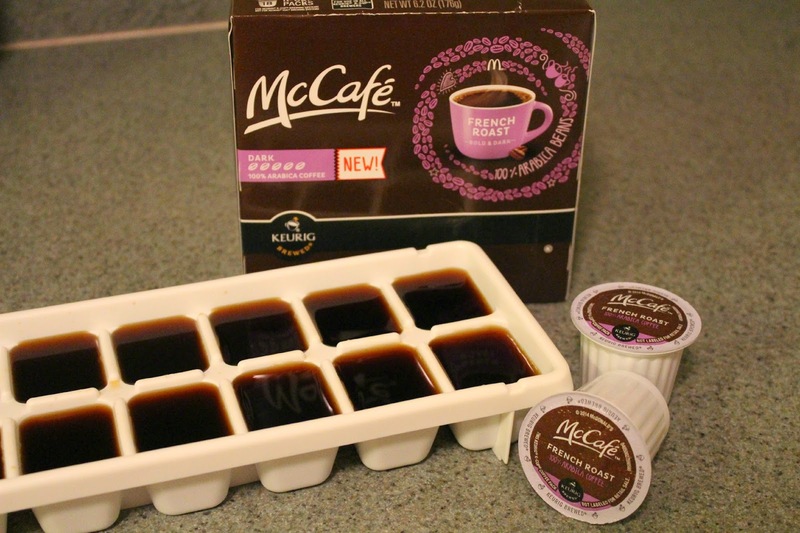 Brew 2 McCafé Coffee Pods the night before, cool to room temp and freeze in an ice cube tray. Gather all the ingredients for the smoothie. Blend together until smooth with a stand or immersion blender. 1. The night before, brew 2 cups of coffee, cool to room temperature and freeze in an ice cube tray. Peel and wrap a banana and freeze. Brew 1 cup of coffee and store in the refrigerator overnight. 2. In a stand blender or with an immersion blender, mix together the Coffee Ice Cubes, Banana, Coffee, Vanilla Yogurt, Cocoa Powder and Vanilla Extract until smooth. Enjoy!